Gotta love Spring in Florida! The temperatures have been in the 80's-90's, the plants are producing new leaves and flowers, and the oak pollen is EVERYWHERE! So far, the pollen count has been astronomical this year. I mean, it's been so bad that despite my daily use of Goldenrod and Nettle, I have been left with a horrible cough. So the next herb I'm going to turn to is Coltsfoot. Tussilago farfara is known by several common names, most of which have to do with the shape of the leaf. It resembles the hoof of a horse, or Coltsfoot. Though the flowers appear long before the leaves, and when the leaves to begin to show, the flowers are gone. The flowers are commonly mistaken for dandelion flowers and they appear around the winter solstice and at the very end of winter, right around spring. This herb has been used since the time of Ancient Greece and has been so popular that in 18th Century France, it was used on the signs of every Apothecary. I have used this in my personal practice since the beginning. One of my first formulas for chest congestion included Coltsfoot, Marshmallow, and Comfrey. This combination is one I still tend to use today. Parts Used- Flowers, stem, and leaves. Summary of Actions- antiscrofulous, antitussive, astringent, demulcent, emollient, expectorant, tonic, slight bronchodilator, respiratory stimulant, antispasmodic, anti-inflammatory, and antiseptic. Traditional Chinese Medicine (TCM)- Known as Kuan Dong Hua (which translates as “winter-arrive flower”), Coltsfoot is a well known Chinese remedy. Though Chinese herbalists tend to only use the flower and bud, it's used in practically the same way as we use it in the West. It covers both qi and blood aspects. It moistens the lung, transforms the phlegm, and suppresses cough. All of this is due to it's heatless warmness, moistening pungency, and unblocked sweetness. It's acrid and slightly sweet in flavor, warm in properties. The main meridian it's used on is the Lung meridian. It's used in all cases of cough, no matter the cause. Cough- Tussil means “cough” and ago means “depart.” So it's not wonder that this herb is most often called upon to help dispel cough. 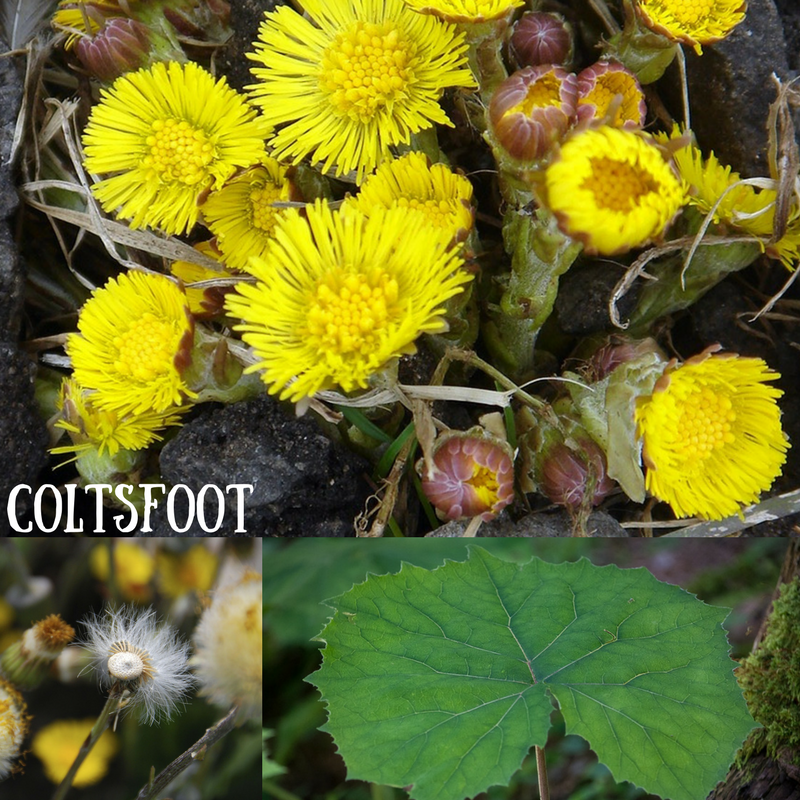 Coltsfoot works well when dealing with any kind of cough, and has historically been used for every kind of cough. It works especially well in the case of chronic cough, or coughs that accompany emphysema or silicosis. Historically, a blanket would be soaked in a Coltsfoot preparation and wrapped around a patient with whooping cough. Smoke It!- Coltsfoot was traditionally smoked (often blended with other herbs) to help treat cough and other chest problems. It has also been known to be added to certain tobacco blends to enhance the smoking experience. Several herbalists recommend Coltsfoot as a tobacco alternative for those looking to quit smoking. Lungs and Throat- Coltsfoot has traditionally been used to help clear the lungs of infections. It's great to help get out any phlegm that is in your chest. It's been used, since Ancient Greece and Rome, to help open the lungs in cases of asthma, and to relieve bronchial congestion. It's also useful for laryngitis and sore throat. Coltsfoot tea is considered the safest way to achieve these results, but I also like to use Coltsfoot infused honey as well. Sin Conditions, Hemorrhoids, and Varicose Veins- A poultice of Coltsfoot is also known to work well for skin conditions such as sores, eczema, ulcers, and burns, as well as hemorrhoids and varicose veins. Edible Flowers and Stems- The flowers can be eaten raw, in salad, or fried in honey and are loaded with Vitamin C. The stalks resemble tiny asparagus stalks and have a similar flavor when cooked. Contraindications and Warnings- Coltsfoot contains hepatotoxic pyrrolizidine alkaloids (PAs) that can lead to cancer or impairment of the liver. Most of these PAs may be destroyed in the process of making preparations, but just in case, use caution. Pregnant and breastfeeding women should avoid the use of this herb. People who have allergies to ragweed may have a reaction as it's in the same family. Other people who should avoid this herb include those who have heart disease, liver disease, and high blood pressure. I only included a basic introduction to this amazing herb. 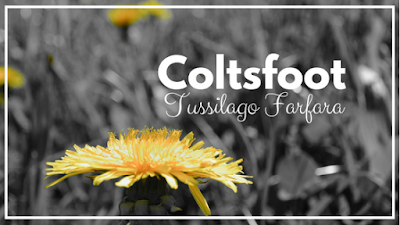 I hope you have learned a new appreciation for how amazing Coltsfoot is. If you have any questions or comments, please leave them below.